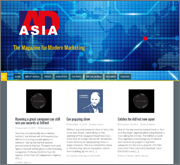 Dear AdAsia reader, now that you see this page you have reached the new AdAsia website. Behind the scenes we have been working on this for a few months. The design of this site is more in tune with today’s requirements. It is responsive e.g. so that it is easier to view and navigate on mobile devices. All the content from the past years has migrated to the new site too. You can use the search function to find back articles we have published over the years. Let us know if you experience any issues with accessing this new site by sending us an email to editor@adasia.com.sg.